A FEFLOW .FEM file (.ASCII) is generated. Once you have the conceptual model designed and at least one finite element mesh, you are ready to populate this mesh with the conceptual data. 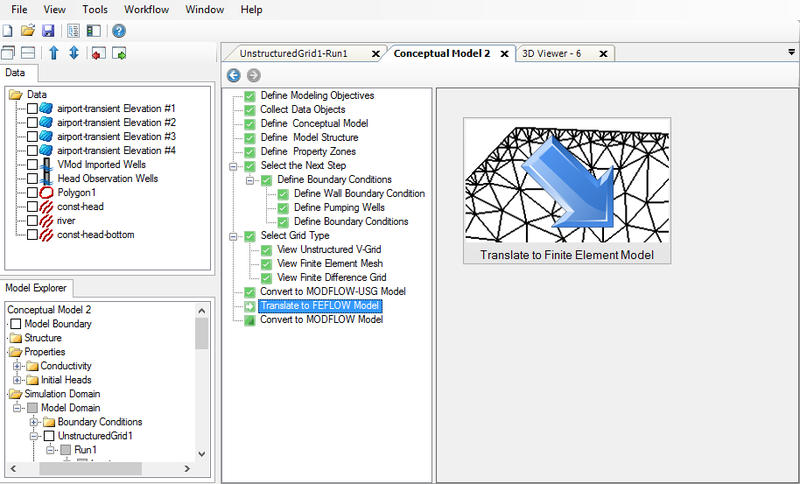 Proceed to the "Translate to Finite Element Model" step in the Conceptual Model workflow; this is shown in the display below. A brief description of the project. By default, this is the name of the current Visual MODFLOW Flex project. Select the desired finite element mesh from the combo box to use for model translation. Click the button and specify the output name and directory for the *.FEM file that is created during translation. The .FEM file is an ASCII file containing information on the problem class and model properties. This file is required for importing your model into FEFLOW. The default file name is “Project_name.FEM” and the default directory on your computer is [Project Folder]\Numerical Models. 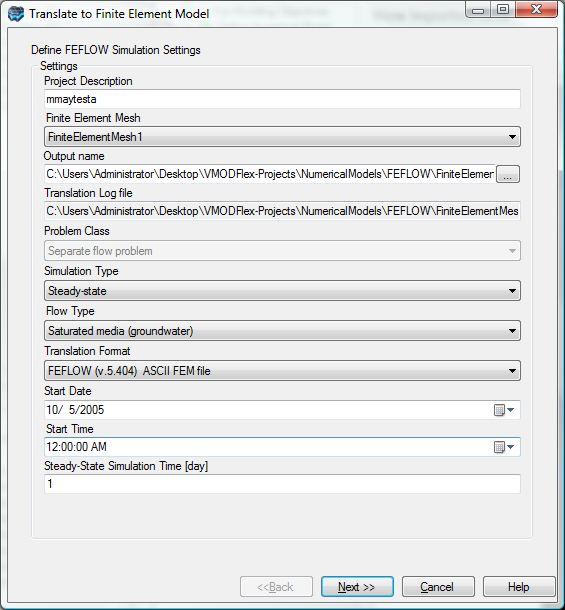 When a numerical model is translated in Visual MODFLOW Flex, a log file is automatically generated and saved on your computer. By default the log file name is [Project_Name].LOG and the directory is [Project Name]\Numerical Models. Click the button to specify a new file name and directory. Currently, Visual MODFLOW Flex only supports the separate flow problem class. Select Steady State or Transient from the combo box. If the Steady State option is selected, Visual MODFLOW Flex will prepare the data set for a steady-state flow simulation, and will automatically use the data from the first stress period of each boundary condition and pumping well defined in your conceptual model. If the Transient Flow option is selected, Visual MODFLOW Flex will automatically merge all the different time period data defined for each pumping well and boundary condition into the stress period format required by FEFLOW. Select the flow type of the problem class. Choose from the following options: Saturated media (groundwater), unsaturated media, Unsaturated steady-state linearized Richards equation. The output .FEM file generated by Visual MODFLOW Flex during translation is currently compatible with FEFLOW v.5.3.11 or later. The default start date is the date specified in the conceptual model settings. The Start Date of the model is the date corresponding to the beginning of the simulation. This date is relevant only for transient flow simulations where recorded field data may be used for defining time schedules for selected boundary conditions. Specify the simulation start time. The Start Time of the model is the time corresponding to the beginning of the simulation. This time is relevant only for transient flow simulations where recorded data may be imported for defining time schedules for selected boundary conditions. A steady state simulation time is required for Steady State Flow simulation. This parameter is not used if you have selected Transient Flow. Although the simulation will always be run to the same equilibrium solution in Steady State, the total amount of water passing through boundary conditions (i.e. the cumulative value of the solution) depends on the amount of time simulated. The Packages frame contains a list of existing boundary conditions for the conceptual model being translated. Here you can include/exclude boundary conditions by selecting the appropriate check box in the Translate column. 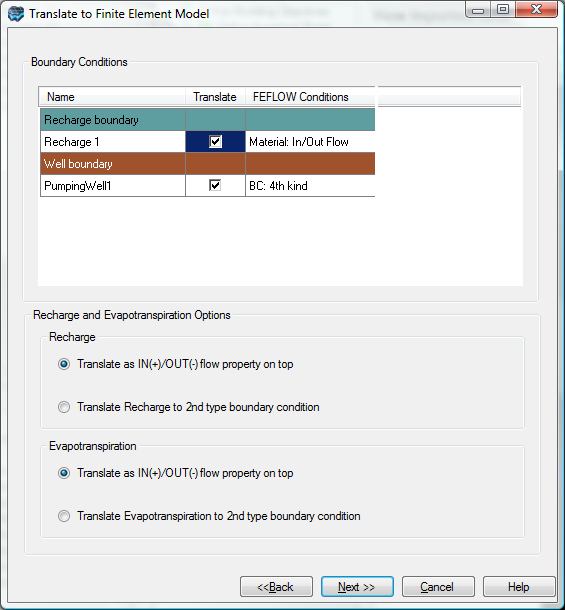 The corresponding FEFLOW condition type is listed for each boundary condition under the FEFLOW Conditions column. You can also select how Recharge and Evapotranspiration should be represented: As Flow Properties or as Type2 Boundary Condition. Click the [Next] button to initiate the model translation. During translation, output details are displayed in the translation log. Once finished, click the [Finish] button to exit the translation wizard.